I know on Mother’s Day we’re supposed to really focus on just our mothers, however today I want to pay a quick tribute to both my mom AND dad. In addition to today being Mother’s Day, today my dad was released as the bishop of my family’s home ward. He has served in that calling for 6.5 years. 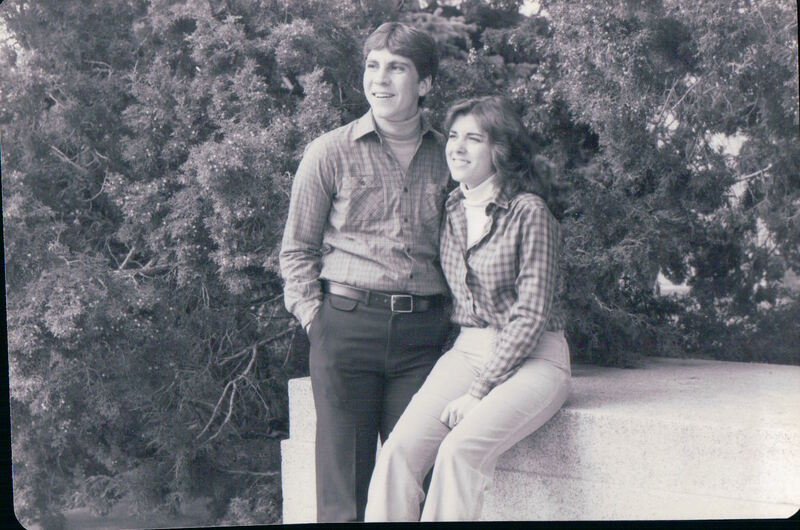 Before that he was in the Stake Presidency, following the shortest stint as the bishop (only 9 months) of the same ward, and prior to that he was in the bishopric of our stake’s single’s ward. My dad has been in consecutive leadership callings in our stake for longer than my youngest brother (who turns 19 in August) has been alive. Before that my dad served in the bishopric in our ward in New York and other callings. My mom has had many callings of her own – YW presidency, Primary presidency, Sunday school teacher, Early Morning Seminary Teacher to name a few – but through all of those callings she has also been supporting my dad in his. Many nights of not knowing if/when my dad would be home for dinner, helping those in the ward who were secretly struggling, getting 5 kids ready for church more or less on time on her own each week (a feat that I’m sure was infinitely easier once her oldest child left the house 😉 ), allowing other families’ needs to intrude on our own family time, and countless other small but significant sacrifices through the years. I know there have been times when the load seemed heavy and probably even too much to bear, but through it all both of my parents have been cheerfully – and sometimes tearfully – willing to sacrifice and serve. For those of you who aren’t familiar with our faith, these callings represent many hours every week – including most of the day on Sunday – with absolutely zero pay, it is done on a completely volunteer basis. Although volunteer suggests that my dad would have gone to someone and requested these assignments – the opposite is true. For each of these callings someone else in our church leadership would have called my dad in to a meeting and asked him if he would be willing to do this regardless of what other plans my dad might have had at the time. He has continued to hold a full time job to support our family while giving up his nights, weekends and vacation time to serve those in their area willingly. My mom has told me that the very best thing she could have done was to make that sacrifice to allow my dad to serve in these callings. She has told me that by supporting my dad in these callings she has in turn received a husband who is more compassionate, closer to the spirit and more fulfilled than had she selfishly kept him at home to help her with dressing kids for church and the other things that I know she would have appreciated his help with. She’s told me how she’s heard other women tell their husbands that they couldn’t accept these callings that require so much time and effort because they needed the help at home. She doesn’t belittle these concerns – she knows firsthand how legitimate they are – the sacrifices are indeed significant. But she’s testified to me that while it’s been hard – she has gotten more in return for her sacrifice than she would have received any other way. So, today I want to wish a Happy Mother’s Day to BOTH of my parents. Thank you for teaching me the value of service and sacrifice. Thank you for teaching me that there is no better way that I can bless the lives of my family than by serving the Lord. I know that their service will not end here – soon enough they’ll find somewhere else to be made useful in serving and loving those around them. They won’t be happy sitting still for long. They know all too well that “when ye are in the service of your fellow beings, ye are only in the service of your God,” and I know they won’t be satisfied not having a way to use their time and talents to serve God. That’s the best example I could have asked for, and I hope that I follow that example in my own live. I love you Mom & Dad! This past Tuesday I went on a hike with our ward’s Cub Scout Pack. One of my current callings is as Cub Scout Committee Chair and Eric serves as our ward’s Cubmaster, so even though we don’t have any cub scouts in our family yet we are very involved with the organization. Every year we’re supposed to organize a hike, which we’d intended to do back in May, however our original hike got rained out so we postponed it until this past week. Luckily where we live we are close to lots of great hiking trails so it wasn’t too hard to come up with a great hike. Tuesday turned out to be a very busy day for me because there was a field trip organized at the Discovery Gateway Museum for homeschooling families which I wanted to attend with my kids. We ended up going from there straight to In ‘N Out for dinner, then to Walmart to pick up a snack for the cub scouts, and then immediately to the trail head to meet up with the scouts. I hadn’t definitively decided if I was going to brave taking my 3 kids on the hike or just wave the scouts off. We ended up having plenty of adult leaders show up but the kids were excited about going on the hike so we decided to at least start out and I knew that I could head back at any time if it became too much for them. Unfortunately because I hadn’t made it back home and hadn’t fully planned to take my kids on this hike I hadn’t brought our hiking backpack with us. So I was stuck carrying my 19 month old Maeli on my hip – extra awesome since my back has been acting up a little lately. We quickly fell behind but I wasn’t too concerned. As we started out I put her down and she would walk some of the way, but then she’d stop every few feet and find a rock and say, “Oh, this is a rock! Oh, this is a rock!” Hiking is pretty slow going when you get excited about every little pebble on the trail. Normally I’d indulge this excitement, but since we were hiking with a larger group, and we were cutting it close on time to get the hike finished before dark anyways, I couldn’t let her stop to look at all of the rocks and carried her along the way. On the way up to the falls I did pretty well carrying her. Then one of my friends took over and carried her for a little while and then she was handed off to Eric who carried her the remainder of the way to the falls. After we rested at the falls and had our snack we started down a different trail to get home. I took Maeli back so that Eric could lead the cub scouts and we quickly fell behind again. After being carried for so long Maeli started insisting that she would walk all by herself. She would say “Oh, this is a walk!” and did a pretty good job hiking on her own for her age. She did better on the way back about not stopping to comment on each individual rock, but 19 month olds do not walk exceedingly fast. I tried to carry her but every time I picked her up she would flail around like a fish out of water and say “whoa! whoa! whoa! whoa!” until I would put her down. She fell down on the trail a lot. But she refused to be carried by me, or by any of the other adults. She did let me pick her up whenever a bicyclist came down the trail and I would take advantage of those opportunities to walk with her as quickly as I could and get her as far as possible before she started flailing again. 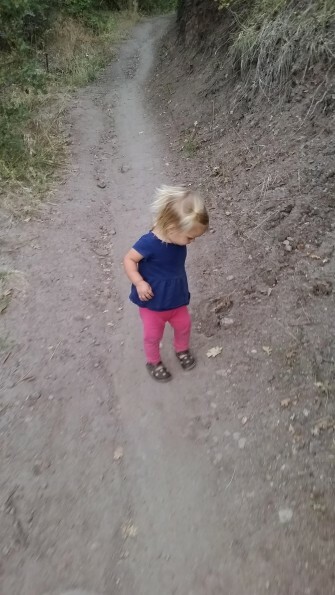 I really wanted to just carry her and get us back to the trail head before it became dark but our progress was slower with her fighting me than it was just letting her walk so we went slowly on. Maeli stopping on the trail to rub her poor banged up little knees. She would stop like this every so often, but adamantly refused to let me pick her up. Unfortunately because we weren’t taking the same trail back as we’d taken out, and we’d fallen behind, there were a few times when I was concerned that we might get lost. I am exceptionally good at getting lost, even if I really stop and try to think things through I just seem to have a talent for picking exactly the wrong direction. Luckily I had my cell phone and I was able to call Eric at one of the junctures and ask him to clarify which trail I was supposed to be taking. At another point I was able to ask a bicyclist going the opposite direction if he had seen the group as he’d come down the trail and he was able to confirm that he had. The trail head was right next to the Draper Utah Temple, and as I turned around a corner I was able to see the temple and knew that even if I hadn’t picked exactly the right trail, I was at least heading in the right direction. As we got a little further down the trail I heard some of the other leaders calling my name and they waited until we caught up to them so that we weren’t alone on the trail and they continued with us for most of the rest of the hike. We did make it back to the trail head just before it was fully dark and I really enjoyed the chance to be out in nature and enjoying Heavenly Father’s creations with my children. While we were hiking I thought of some analogies that I could draw from the experience. The most interesting one to me was watching Maeli on the hike. She was doing something that clearly she was not qualified for. 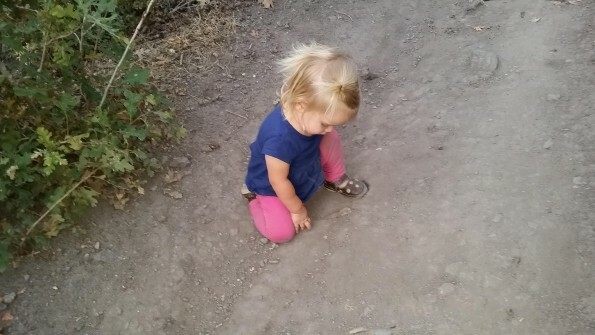 I didn’t bring her on a 3 mile hike because I thought that a 19 month old should be able to do that on her own. I brought her with the intention that I would help her along the way, and that she would be given ample assistance by me and the other adults. At first she accepted that help for the most part and we were able to get her through what was the easier part of the journey. Then she refused assistance for most of the more difficult part of the journey. Instead she would fall and sit and rub her banged up knees while we were standing there willing and wanting to help her get through the hike without too much more pain and suffering. Because she was going so slowly we all fell behind and barely made it back before it would have been too late. As I watched this it made me think about all of us here on earth. Sometimes we are faced with challenges that are enormous – far outside our capacity to do it on our own. Our Heavenly Father puts those challenges before us, but he also puts a support system around us to help us through it. How often do we refuse the assistance of others because “Oh, this is a walk!” or as we might say “No, I need to do this on my own. This is my challenge and I will do it myself.” I wonder if the Lord looks at us and says, “You ninny! I didn’t want you to do it on your own. You don’t need you to do it on your own… that’s why I put all that support system around you!” He doesn’t intend for us to get through this life on our own, he wants us to do it with the help of our family, friends, church leaders, co-workers, neighbors, random people on the street. Why do we insist on doing things ourselves while our family and friends stand by wanting to help us, but instead force them to watch us as we fall down and bang up our knees and sit there and cry? There is no shame in getting help from other people. You don’t get points docked in some cosmic final exam for taking hands that are outstretched to you. In fact, I think one of the great objectives on that test is to see if we will work together with others. Plus, it’s good for them if they can help you to get off the trail to where you’ll be able to work towards your next goal instead of keeping them back on the trail with you. Our friends and family will no more abandon us in the trials of our life than I would have left Maeli there on the trail to get back on her own. If you’re going through hard times, please accept help from those who are reaching out to you. The important thing is to get to the end of the trail and then be able to help others – don’t get caught up in thinking you ought to do it alone, you were never meant to do it alone. The other thing that made me think was all of the different ways we were able to receive guidance to know that we were on the right trail. I think when we are looking for direction in our life we can do a lot of the same things. I was able to use my cell phone to get guidance – and we can seek inspiration through prayer. I was able to ask a bicyclist on the same trail for his knowledge – we can counsel with who are passing through life with us for their help. My friends called for me and waited for me – we can lean on the support of friends and family that are watching out for us. My friends set another example for me . We should also try to be like those leaders and watch for those who may have fallen behind or could be lost. We are our brother’s keeper and we will be responsible for having done all we could to help them along the path – who do you need to call out to and help bring them safely home? 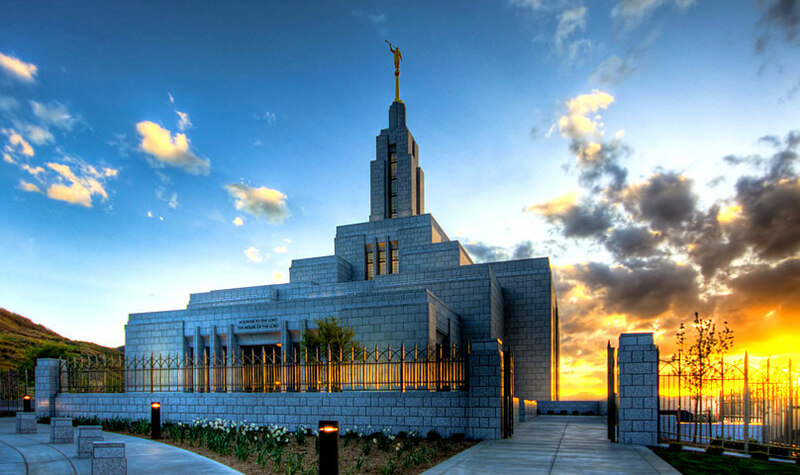 Most importantly, we need to be sure our focus is always on the temple. If at the checkpoints in your life you can see that your journey is bringing you closer to Christ then you know you’re on the right path. Keep going and keep working towards it and the light of Christ will guide you home. I saw this poem today on my friend’s Facebook wall and felt compelled to share some thoughts I had. 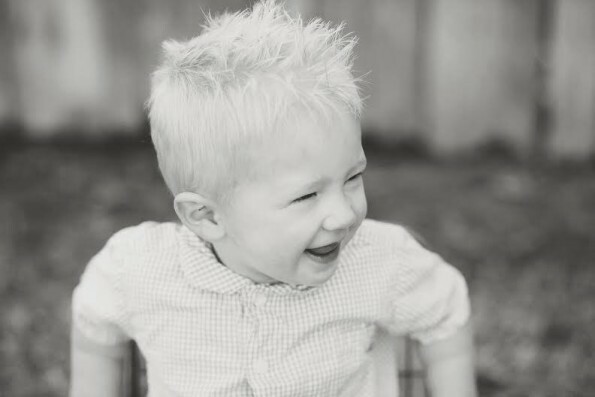 Yesterday marks one year since sweet Kayson Shelton left this life. In that time I feel like I have grown and changed so much and I wanted to share some of that experience here. On June 6, 2014 I was at home with my family and we were getting ready to eat dinner. My sister was over with her son and my brother was over too, we were just about ready to head up to the local swimming pool for a fun evening before a trip to California the next day. Just as we were about to pray over the food Eric pulled me aside. He told me he’d just received a text that the Shelton’s son had just passed away in an accident. My first reaction was just “oh, how sad” without much feeling behind it – like this was something that had happened to someone far away that I didn’t know very well. I gathered the family for a blessing on the food and prepared to go on with our evening. For whatever reason it takes me a little while to fully react to things like this. As I stood there a minute longer while we were praying it really started to hit me what had happened, Kayson – the little boy who I’d seen just a week before, my son’s friend, my friend’s son – was gone. Suddenly I started to cry, hopeless, helpless tears of sorrow. I was imagining what Toni was going through, what she was explaining to her children. I could see myself in her shoes trying to grapple with such a loss. It was so overwhelming. I went down the street to talk to my visiting teaching companion (Toni was one of the sisters we were assigned to watch over) and met a neighbor at the door. I cried with our neighbor, and then cried some more with my companion. I went home, took Maeli upstairs with me and just cried and cried some more. I walked into my closet and cried, I nursed Maeli and cried. I sent Toni a text feeling so inadequate but needing to do *something*, and I cried some more. I tried to think through what I could do but since the Sheltons were in another state I felt at a total loss. So I put on my swim suit and cried. I called my mom to tell her what had happened, and cried. We drove up to the swimming pool and luckily Maeli had fallen asleep so I just sat with her on my chest, on a beach chair with my sunglasses on and cried. We came back home and I started trying to pack for our own trip to California and cried some more. A couple hours later, as the news had spread through the neighborhood and we’d gotten our boys to bed, I saw a gathering of neighbors at the Shelton’s house. I didn’t know what they were doing or what I could do, but I had to be with them. So I walked down the street and hugged my friends, and cried. We saw Toni’s facebook post with her last picture of Kayson telling us that his last words in this life were “I love you” and we cried some more. We sprang into action to find things that we could do for the Sheltons, but since it was late at night most of those plans would have to wait until morning. We said goodnight to our friends and walked home. I sat on our couch and put together a memorial website for Kayson and my head was throbbing from crying so much and there were no more tears left in me, but still I cried as I put pictures and memories of him together to share with the world. The next day we packed to go to California. I hated to be leaving during a time of crisis , but I knew there wasn’t much I could do there. I did what I could to be part of the service projects before we left – I made a freezer meal, helped with care packages, fielded website inquiries, and cried some more – then we packed up the car and left. I cried periodically the whole way to California. Then we got there and I cried some more with my mom. On Sunday I attended church in my parents ward and just sobbed violently for most of the meetings. I received hugs and support from people who had known me since I was a young woman, and the families in my parents ward cried with me. The next week was filled with media inquiries as the news caught wind of Kayson’s story. I cried as I responded to emails. I had put together an online fundraiser and was touched as I watched donations roll in from all over the world. My phone was beeping incessantly and my mom commented on it. I told her that I received an email every time someone made a donation. I was so grateful for all those beeps and dings. So much of my faith in humanity was built as I watched how people rallied around this family. And I cried some more. We came back for the funeral and cried and cried and cried. The next several months consisted of frequent periods of crying. I would watch any Mormon Message and cry. I would see my kids playing and think of Toni and cry. I would be doing dishes and start crying. Little kids are not supposed to die, that’s just not the way I felt this world is supposed to work. Obviously I knew that little kids could die, but that happened on the news, to people far away from me. Not to my neighbor. Not to my friend. Suddenly my own children were much more mortal than I could handle. I found myself checking multiple times during the night that they were still breathing and not wanting to go to sleep lest I wake up and find one of them gone. All I wanted to do was to snuggle up close with my family and never ever let them go. Going through this experience I felt like there was a part of me that was broken that could never be fixed again. It was too much, the pain was too big. However, as the time went by I cried hourly for days, daily for several weeks, several times a week for a few months and then several times a month. Slowly I found myself able to look at my children without a feeling of terror that they would slip away at any moment. I still cry sometimes, but that soul wrenching pain that I felt has passed somewhat. My overwhelming grief was able to be replaced by a tenderness in my soul that won’t go away, but it’s not broken anymore. The tenderness is a good thing, it’s a new part of who I am, I’ve been re-made into a more kinder, more loving, more compassionate person. I just felt the need to share this experience and reiterate my testimony of the atonement. It is so very very real. It can take the things that you think can never be fixed, never be made clean, never be healed, and somehow – it heals them. Our Father in Heaven loves us, dearly. He is there for us when we have reasons to cry, and he cries with us. He sends others to help us in those times of despair, and we can be made whole again. I truly am grateful for this opportunity that I’ve had to walk a mile with sorrow. I have learned and grown in ways that I couldn’t have any other way. It might not be an experience I would wish for, but it’s certainly one I will cherish. I just want to say thank you to Toni and Scott for letting me be a small part of this experience, it has touched my life and changed me for the better, and I know it’s done the same for many others as well. 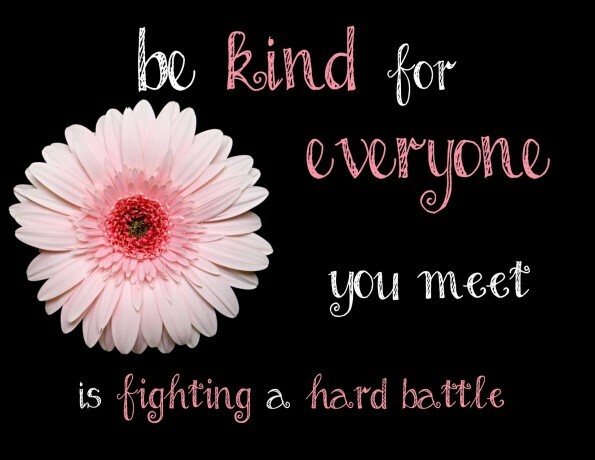 The quote at the beginning of this post is something that’s been on my mind frequently over the past year – “Be kind for everyone you meet is fighting a hard battle”. I’ve seen this quote in the past and thought, “sure, some people are fighting really hard battles, but there are people who really just have it easy. Maybe more people than I think are facing something hard, but not literally everyone.” However, over the past year I feel like I have gotten to know more of people’s challenges. Just out of the people I know here are some of the struggles I’ve been privvy to in the last several months – cancer, death of a loved one, infertility, feelings of inadequacy, divorce, depression, loss of faith, separation from children, illness, difficult pregnancies, rebellious children, anxiety, job loss, money problems, unfulfilled dreams, loneliness, moving from home, fear, sleep deprivation, debt, and abuse. That’s a weighty list, and for most of those trials I can name more than one person who has recently faced it. Moreover, if I think carefully through people I know well I can come up with something each one of them is facing that is difficult, and I’m sure there are many more inner struggles that I am completely unaware of. I know there are people that seem to have things so easy, but as you get closer to them you will find there is something they are actively struggling with. Trials are an integral part of our life here on earth. They are the experiences that help us grow, and everyone is growing in one way or another. I wanted to share one of my own experiences that I think illustrates this. Those of you who follow my husband’s blog may know that he mentioned a bout he had with depression. If you know Eric that revelation was probably something that surprised you. Eric is positive, driven and bright – not exactly a poster child for depression, and before he posted about it almost no one knew what he’d been going through. However, he was feeling undervalued in his position at work. It was demoralizing for him to have to prove and reprove his worth and to fight tooth and nail to keep his projects going every single day. Understandably it got to him, and he started to escape his frustrations by spending a lot of his time playing computer games. Just to have an arena where he could feel more successful. Gradually, he sunk further and further into depression and even when he was home I saw less and less of him. Despite my best attempts to try and help him, he withdrew into himself and I was at a loss for how I could help. Meanwhile, even I misunderstood what he was dealing with. I underestimated his struggles at work knowing that he loved what he’d been hired to do, and thinking that balanced out his frustrations. However I was keenly aware of the changes in his behavior, though I tried to keep them between us. Not understanding the real cause I attributed his depression to the wrong things. Since what I observed was mostly him withdrawing from me I assumed I must have been the problem – that his life with me wasn’t what he’d hoped it would be and he preferred his computer as an escape from the poor choice he’d made to marry me. I felt hurt, alone, and like I had no control to make things better. I began to sink into a bit of a depression of my own. Just like I misunderstood Eric’s struggles he misunderstood mine and we were both unable to help one another. Eventually we were both able to work through these challenges and we’re stronger now for having gone through them. But the point of that story is that here we were living in the same house, truly loving one another, and each suffering inwardly. Somehow even with the love we had for one another, we missed what the other person was going through. It amazes me that – even with the time we would spend together, as much as we would talk to one another and as much as we loved each other – we still missed the battles playing out right in front of our eyes. After that experience I’ve come to realize just how easily other people’s challenges can be hidden from view while things seem fine on the surface. Or how easily we can attribute someone’s actions to the wrong things. I’ve learned to not assume I know what another person is experiencing and try to show compassion unconditionally. It’s easy to look at someone else’s trials and think how much more difficult our own challenges seem to us. Of course, it could almost always be worse and we should always try to be grateful in our circumstances. But putting someone else’s difficulties down because it doesn’t seem as hard as what you’re facing is ridiculous and helps no one. I struggle with children who are not fantastic sleepers – not the biggest problem that anyone’s ever faced, but it’s one of mine. I have heard people say things like, “you should just be grateful that you have children.” They’re not wrong, and the truth is, I am grateful for my children and I don’t begrudge them the many sleepless nights. But that doesn’t negate the fact that I am tired and sometimes I need someone to just give me a hug and tell me that I’m going to make it to bedtime. Belittling my exhaustion because it could be something worse isn’t helpful. If we want to become like the Savior then we need to stop trying to judge other people’s actions based on what we think we know of them. We need to give each other the benefit of the doubt that their struggles are real, whether they makes sense to us or not. We need to let them manage their trials as best as they can and be there to support them in any way possible. No matter how trivial their trials might seem to us. Our judgement of their trials doesn’t matter, what matters is how we respond to them in their need. I recently watched a beautiful example of someone who already does this. As my readers know, my dear friend Toni lost her sweet son Kayson in the middle of last year. Recently, I was sitting with her and another friend as our friend was expressing her frustration with parenting a difficult son. Toni could have snapped back, “You should just be grateful that you still have him here, don’t you know what I would give to be going through those difficulties right now instead of the one I have?” Instead I watched as she sat there and lovingly commiserated about the difficulties of parenting, offering advice and support. Our friend said something about how trivial her trial was and Toni graciously responded that it didn’t matter how big the trial was, it was what she was struggling with and that made it legitimate. Helping a friend didn’t increase her grief or do anything to belittle what she was going through. It merely gave her an opportunity to show love for a friend, and you can’t show love for someone without feeling its glow yourself. When we help lift other people’s burdens our own become lightened, not heavier. Can we all commit to trying a little harder, to being a little kinder? Recognize that we don’t know – and can’t know – all the things that another person is dealing with. Let us find ways to lift each other up in our trials. 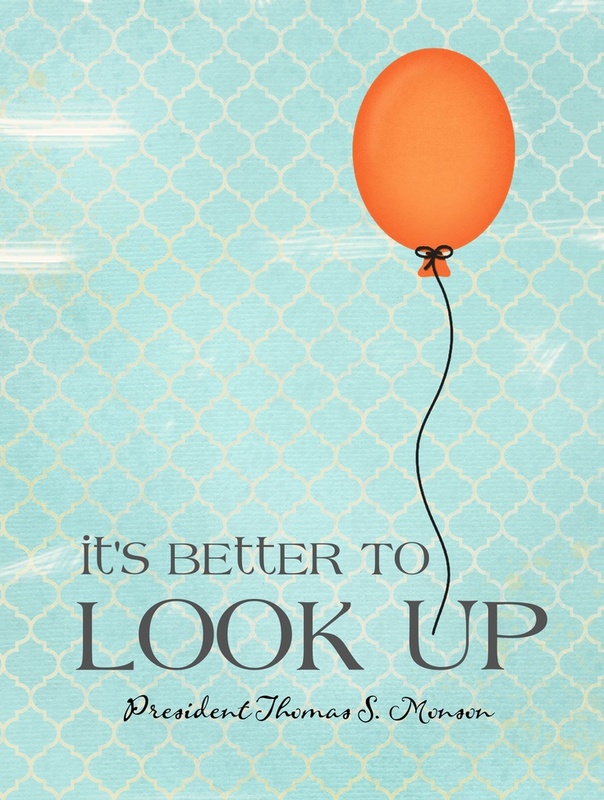 Let us stop comparing and trying to “one up” other’s troubles. Let us be kind.